Apartment building developers and owners should focus as much on catering to renters as on the actual properties, four panelists said at the North American New Apartment Construction and Mixed-Use Symposium and Expo. The ONE Properties Versus development in Calgary features 444 apartments as well as retail and office space. “Traditional property management methods really focused on the physical space over the renter experience,” Oben Flats president Julian Battiston said at the Metro Toronto Convention Centre‘s June 6 symposium. Battiston added he wanted to create an urban lifestyle brand when his firm started looking at building rental apartments in 2010. “If you’re just focusing on the hard asset, you’re missing probably 50 per cent of the equation,” said Ugo Bizzarri, Timbercreek Asset Management‘s senior managing director, chief investment officer and global head of direct and debt investment. Timbercreek owns 21,000 apartment units in Canada and 3,500 in the United States at approximately 250 sites. It’s focused on intensifying its properties rather than acquiring new ones. “You’re going to make more money building a condo than you are with an apartment building if you have to buy the land,” said Bizzarri, whose company is creating larger suites targeting a variety of different tenants at its new properties, including the 44-acre Heron Gate site near Ottawa’s Macdonald-Cartier International Airport. Seventy townhomes were demolished, with their tenants being relocated, so Timbercreek could build 400 apartment units that should be completed in 18 months as the first phase of a multi-part project. ONE Properties has several projects at various stages of the development cycle in Toronto, Edmonton and Calgary, which multi-family senior vice-president Michael Smith outlined for the audience. Toronto’s Queen and Sherbourne is at the zoning stage and will encompass a full city block. The mixed-use development will include 200,000 square feet of retail, 250,000 square feet of office space, a 150-room hotel and 1,900 residential suites in three towers — two rental and one condominium — on a four-acre site. Construction is anticipated to begin early next year. Toronto’s Church and Wellesley apartment project is about to go through the rezoning process after public consultations to determine what the community wants in the neighbourhood. It will feature a single tower with 450 units and retail on the ground floor. 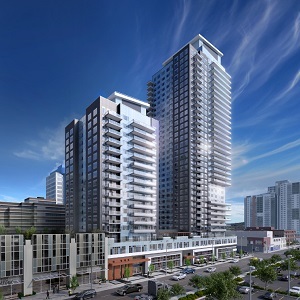 A 43-storey, 573-unit rental tower is being built in Edmonton’s 25-acre ICE District, where Smith said $2 billion worth of construction is underway. Calgary’s VERSUS features 444 rental suites in buildings of 17 and 34 storeys. It also includes 8,500 square feet of retail and 16,000 square feet of office space. VERSUS was completed earlier this year and started leasing in February. Curtis Block in Calgary is going through the permit process. It will have a ground-floor grocery store and 1,100 residential units in two rental buildings and a third that will either feature rental or condo suites. President Oren Vered said Vered Group performs in-depth analysis to see what can be done with a property, the types of tenants it’s likely to attract, the revenues that can be derived and the associated risks and sensitivities when deciding whether to go ahead with a new apartment development. Vered’s new 16-storey, 275-unit Dowd apartment in downtown Montreal is aimed at people in their 20s, 30s and 40s and includes: a courtyard with a dog run, hammocks, a work station and a street chess set; a lobby lounge with a library and fireplace; a gym with a sauna; a large ground-floor bicycle locker; a multi-purpose sky lounge; and a games room with a stage and high-end audio system. “While they’re there, we want to create an experience and environment that will make them want to stay and say the best possible things on social media, because that’s how they communicate with each other,” said Vered. Battiston said Oben Flats aims to have its apartment buildings include: one-bedroom units ranging from 550 to 650 square feet; two-bedroom units with square footage from the high 700s to more than 800; and three-bedroom suites of 1,100 to 1,200 square feet. Oben Flats’ Leslieville apartment was completed in September and its 48 units are fully occupied. It includes: high-end suites; 3,000 square feet of retail at grade; a lobby with piped-in music, free wifi and a wet bar; a rooftop terrace with a barbecue area; a stacked parking system that can accommodate 20 cars in a space which would normally accommodate seven; a gym with locker rooms; bicycle parking; and programming for its amenity spaces to try and build a tight-knit community. The St. Clair West apartment project on Vaughan Road in midtown Toronto is under construction and will feature 51 suites and a two-level underground garage when completed. The company also has an 85-unit project at the zoning stage in Toronto that it’s hoping to have approved in the next year.